The Finance Council advises Msgr. Barry on parish finances and operations. The Council, and its Committees, help oversee budgets and accounting procedures for the parish, school and our 60+ ministries. The Council also offers advice and recommendations on financial risk management, capital improvements, long-term financial planning and other financial matters. The Finance Council is the only parish organization mandated by Canon Law. In addition, Canon Law requires that Finance Council members do not have access to records about contributions of individual parishioners or other confidential information. 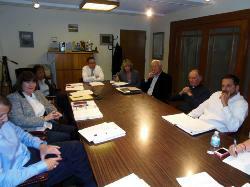 All members of the Finance Council are parishioners with experience in finance and management. Individual members also provide expertise in accounting, law, insurance and financial risk assessment, technology, auditing and other disciplines. The present membership consists of six women and six men. Members are appointed by the pastor, serve for staggered three-year terms and can be reappointed.